Even if you’ve been keeping track of Intel’s Xeon family lines, the Xeon D family could probably give you cause for confusion. The same ‘generation’ of products spans a wide range of processors, from the dense ECC-enabled server all the way through to a big bustling cryptography and a network acceleration chip, when in actual fact each of these products is built on different internal microarchitectures. 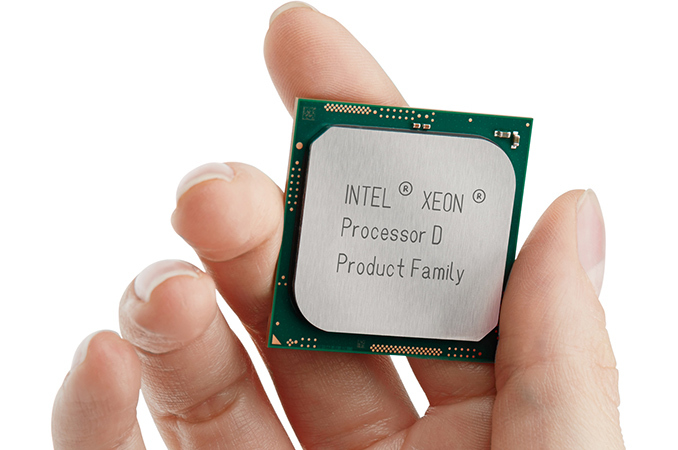 Today Intel is at it again, with the new Xeon D-1600 family. These new Xeon D-1600 processors build upon the Xeon D-1500 line of products, offering up to eight CPU cores. The new chips are primarily focused on edge network, mid-range storage, and space-constrained solutions. This includes control planes, routers, firewalls, base stations, localized cloud infrastructure, and others – the Xeon D chips enable this by bundling the chipset on board, and enabling multiple high gigabit Ethernet options and/or Quick-Assist Technology for cryptography acceleration. 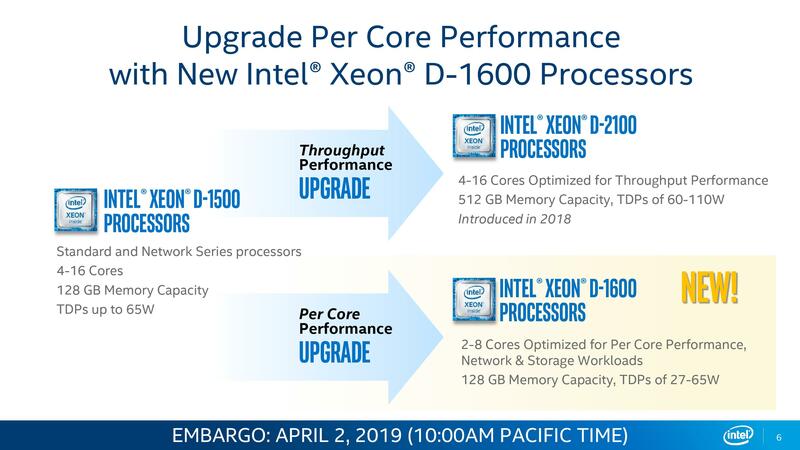 Intel’s product portfolio here designates two potential upgrades from current Xeon D-1500 users: for an absolute throughput upgrade, then look to Xeon D-2100, which offers up to 16 cores and 512 GB of DRAM. However for a per-core performance upgrade, then the Xeon D-1600 processors will fit the bill, with a doubling of memory support and increased frequencies. 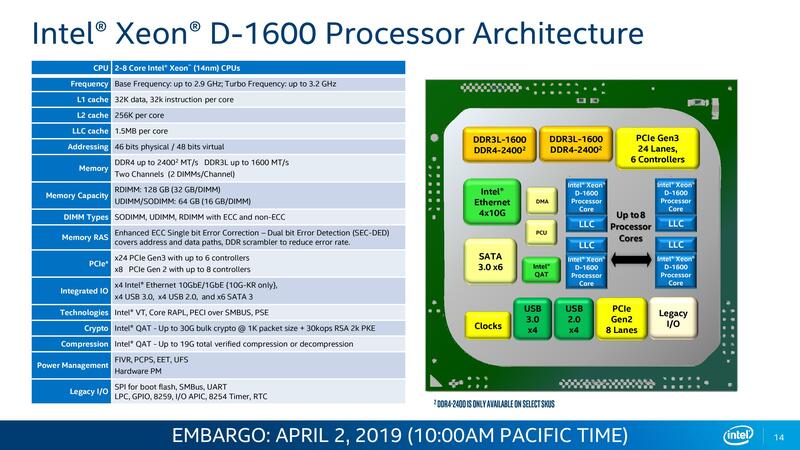 In fact, the Xeon D-1600 processors are built on the same Broadwell microarchitecture as the Xeon D-1500, but take advantage of manufacturing improvements for increased frequencies at the same power as well as the new 16 Gb memory chips for doubled DRAM capacity. As with the D-1500, models are on offer with extended temperature support. One of the benefits of moving the Broadwell architecture to the latest manufacturing updates means that the design can be tweaked – in this case we get a true single-die SoC solution, rather than just a CPU+chipset on a single package. Not every chip will support every feature, but in general the higher the TDP (and the more you pay), the more features are present. Most chips in the family support DDR4-2133, except for a couple that will do DDR4-2400. Every chip above $200 supports quad 10 gigabit Ethernet, and most of the higher-up processors support different levels of Quick-Assist Technology. TDP ranges from 27W for the cheapest dual-core processor, to 65W on the eight core part. Ultimately the D-2100 processors were too power hungry to take the same role that the D-1500 had: by using the Skylake Xeon Scalable based core, the D-2100 aimed more at performance, rather than just an efficiency play. Where the D-1500 parts were used for ‘enough’ performance, efficiency is king, which is where the D-1600 processors should fit in. At least those Xeon-E premiums have pretty much disappeared and I just wish ECC support became standard again on all SKUs, instead of being fused off. SB Game Hacker is one of the most popular Android Games hacking app. This SB Game hacker app is working on many Android devices. You can use this SB Game Hacker Apk to Hack many Android Games like Clash of Clans, Pokemon Go, Subway Surfers etc. SB Game Hacker is an excellent Android application that allows users to hack various Android games with much ease. The game players can only hack offline games on your Android device.